Coppa d’Oro delle Dolomiti 2019, first leg of EpocaChampionship, will take place in Cortina from July 18th to 21st 2019. Eligible cars are vehicles manufactured until 1971. However, the organizing Committee will reserve the right to accept vehicles manufactured from 1972 until 1989 as long as of particular historical relevance and value. In 2019 the Organizing Committee will prepare also a Tribute to Coppa d’Oro delle Dolomiti: vehicles of particular value manufactured from 1990 will be able to participate. Just a few more days and Cortina d’Ampezzo will once again be the hub for lovers of vintage cars and classic regularity racing. 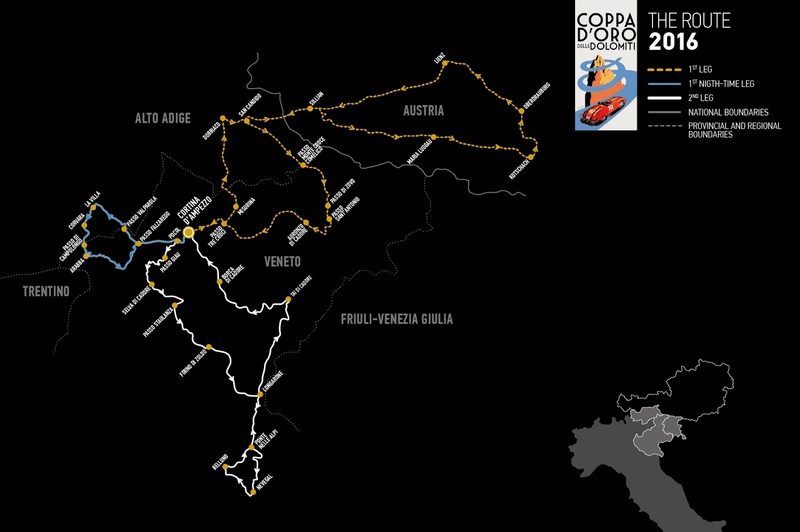 Indeed, the 2016 Coppa d’Oro delle Dolomiti will be held from 21 to 24 July. The race, organised for the fourth year by Meet, under the aegis of ACI Storico and with the approval of A.C. Belluno, will offer four days of pure adrenalin and the chance to enjoy the amazing scenery of the Dolomites. The technical trials on 21 July will formally open the event while the start of the competition is scheduled for the morning of 22 July in Corso d’Italia in Cortina where the teams will line up for the start of two days of fierce competition along charming mountain roads. Cars built between 1919 and 1961 are admitted to the race but a special category with dedicated classification is envisaged for cars dating from 1962 to 1965 that are of specific historic interest or have achieved special sporting merits. 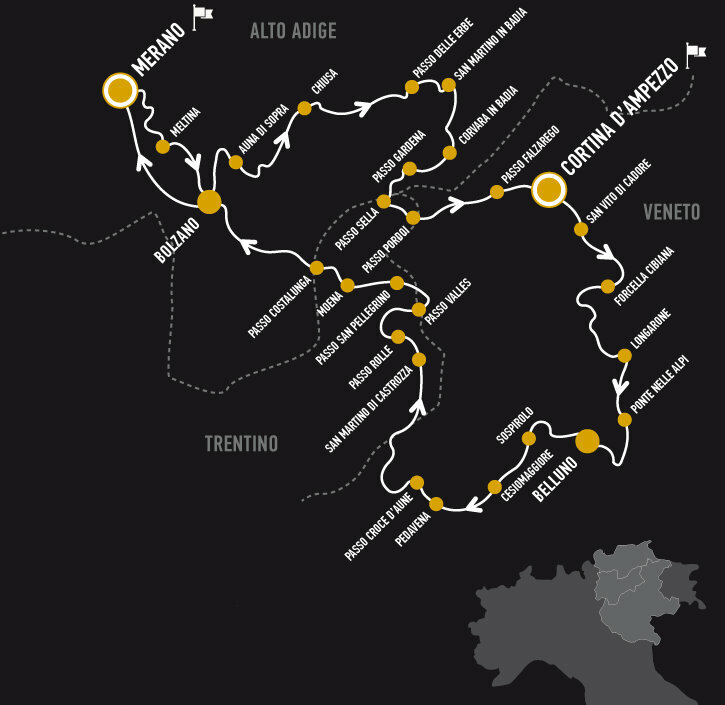 The drivers’ skills will be tested by a route filled with charm and various difficulties, more than 500 km in length and taking in Veneto, Trentino Alto Adige and Austria. The first leg will see the teams passing through Dobbiaco, a charming location at the foot of Tre Cime di Lavaredo, San Candido before reaching Austria passing through Sillian and the following leg with a lunch break in the famous tourist location of Lienz. 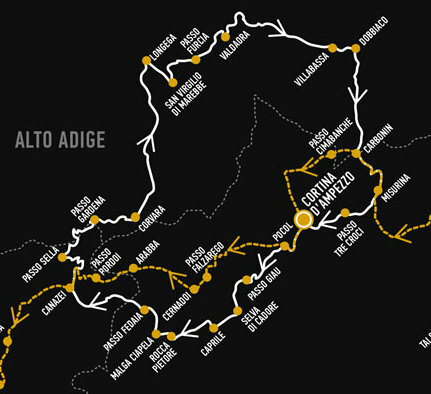 After last year’s success, there will also be a “night-time” leg in the 2016 edition, with departure from Cortina and crossing of the Valparola Pass. The teams will stop for dinner in Corvara in Badia. The location is well-known for having celebrated the feats of great sporting champions, especially the Giro d’Italia and World Cup Skiing. The second leg on 23 July will offer drivers the chance to take in the breath-taking Giau Pass and the cars will subsequently head for Longarone and Belluno. All that remains is to fasten your seatbelts and let yourselves be driven along the heights of passion by vintage gems. The charm of the tradition, the courage of the future. 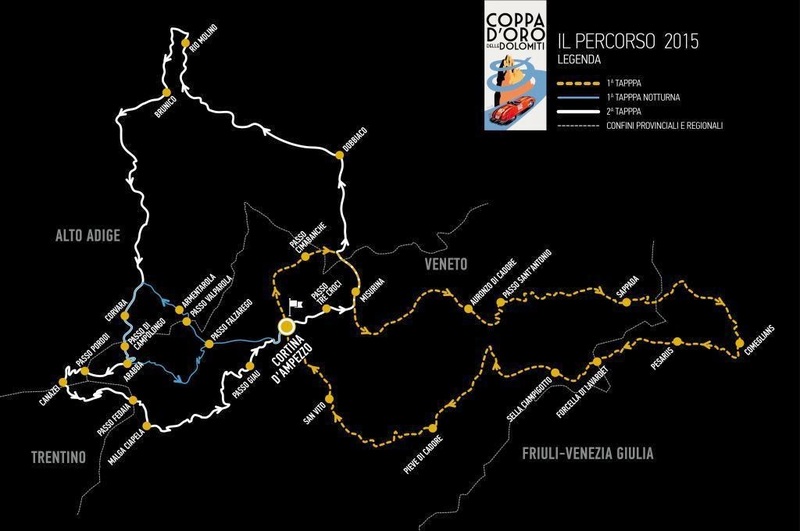 A regularity race which honours its past, but has no fear of renewing itself starting from the introduction of a three part route, with night special stages which will have its beating heart in Cortina d’Ampezzo. This will be the spirit which will mark Coppa d’Oro delle Dolomiti 2015. 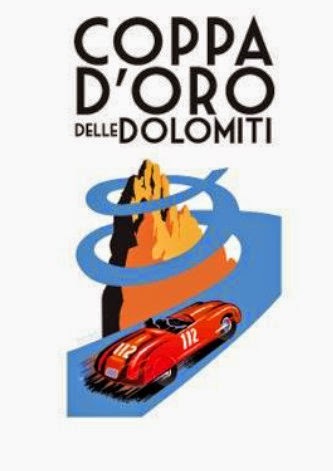 Paying tribute to the days on which the historical race was held, this year the Coppa d’Oro delle Dolomiti regularity race will take place from 23 to 26 July 2015 representing a symbol of past and future Italy. Passion for cars is part of our life and this event blends tradition, culture and great charm. 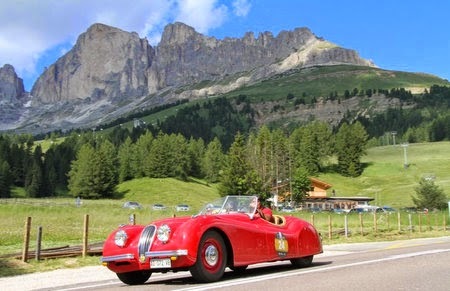 Coppa d’Oro delle Dolomiti is an unmissable event for enthusiasts, it enhances history by promoting on the International stage the winning image of the Country, thanks to breathtaking landscapes honoured by real four-wheeled jewels. Coppa d’Oro delle Dolomiti 2015 is also the future’s courage marked by a brand new route. New features are many, with the addition of a night stage which will take place at the end of the first day of race for a total of 509 km. Thirteen dolomite passes, 45 time trials and 4 average speed trials (two for each leg). The race will will get into full swing on July 23rd with its technical checks. The start of the competing teams, on the other hand, is scheduled for July 24th from Corso Italia in Cortina d’Ampezzo. The race will stop then at Sappada and it will return back to the „Queen of Dolomites“. The night stage will start, during the evening of the same July 24th from Corso Italia. Around 84 km on charming and fully safe roads (because of their low traffic density) to reach Armentarola for the night stop. The Falzarego, Valparola and Campolongo passes will be crossed to return back to the enchanting setting of Cortina d’Ampezzo on the same night enjoying the night view of the village which will be lit to the nines. The second day of the competition will again move from Cortina for coming back there after the stop at Brunico. Suspense until the last km of the race thanks to the average speed trial which will take place on the Giau Pass and which may even reverse the final result during the race day of July 25th. A maximum number of 120 cars manufactured between 1919 and 1961 will be admitted to the race. Moreover, the event features a special category with a dedicated ranking reserved to a maximum number of 30 cars manufactured between 1962 and 1965 which stand out for their racing heritage or their significant historic relevance. The charm of Coppa d’Oro delle Dolomiti is, also and above all, represented by the uniqueness of its routes. „In the World there are many beautiful cars which can run on beautiful roads. But only the most exciting vehicles, driven by the most passionate drivers, can be players in Coppa d’Oro delle Dolomiti, a legendary race which follows the roads of the mountains which were designated World Heritage for their charm and majesty. You don’t race the Coppa d’Oro, you live it; you don’t watch it, you admire it.“ stated the President of Automobile Club d’Italia, Angelo Sticchi Damiani. „Coppa d’Oro never ends: it starts with a green flag like many other races, but the chequered flag is only a moment of the event which leaves its mark in the heart of the attending crews and audience“. The legs are designed for giving to the racing crews the right blend of adrenaline and beautiful landscapes, hairpins and challenging hills will be alternated with surprising and panoramic sections whose charm is surprising with unusual and waiting to be discovered mountain passes such as Forcella Lavardet and Sella Ciampigotto.